This night was one for the record books. Aki's best friend from Kazakhstan, Almas, paid us a visit and this photo was taken on his last night here. We went to a Giants game, then hopped around a few bars before going home. Aki was wasted and passed out. I don't drink, so I was wide wake and took liberties with what I had a hand :P The whiskey bottle and cigarettes belonged to Almas. 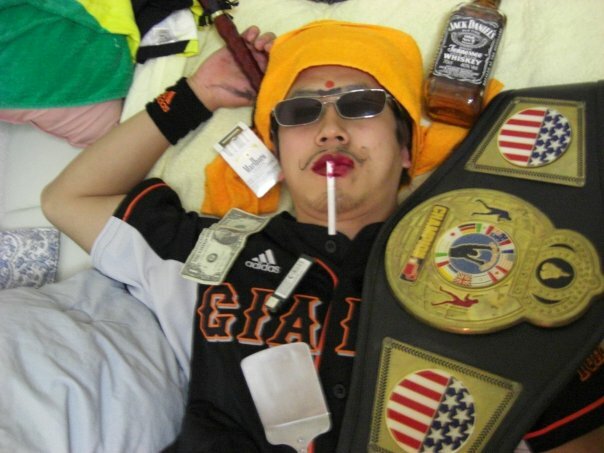 The championship belt is Aki's, he used to be a pro kick-boxer back in the day. The best thing about this night was Aki sleeping through the entire makeover. Even after I took everything off, and wiped his face clean, the man still wouldn't wake up. I saved the photo as my screensaver, and called it a night. In the morning, when Aki woke, I asked him to check something on my laptop. He started laughing and had no recollection of last nights festivities. LOL! Poor Aki! But excellent picture. I don't understand how he could have slept through the application AND the removal. SO SO funny! I swear I thought he'd wake up with all our giggling and the makeup application, but nope, the man was dead to the world that night. Seriously, the man is part bear. When he's asleep he's in deep hibernation mode.